I was browsing online recently for a cute swimsuit cover up, a beach season essential, right? Seriously?! Now what exactly is being covered up?! I was cracking up! Whatever these items are, cover ups they are not! 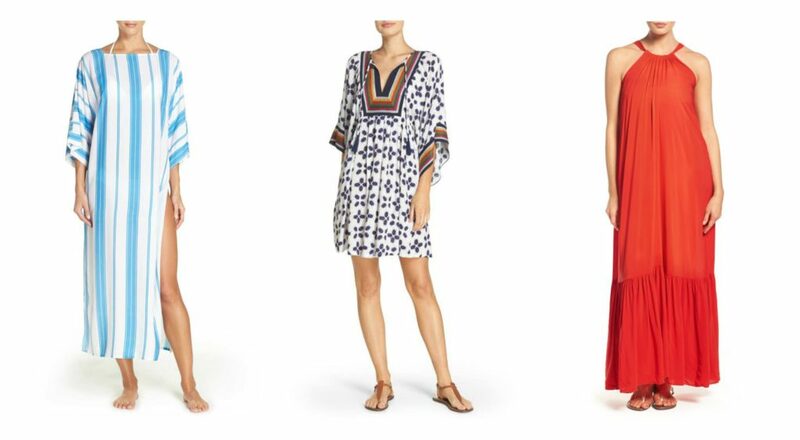 I thought it might be helpful to put together a few fab choices for women who might really want to actually cover up something to for their trip to the beach snack shack! And in case you missed it, here’s the post about my poolside look on vacation in the spring. Is everyone having a fun start to their July? If you follow me on FB and IG, you might know that I’ve had an eventful couple of days, and not in a good way. First I got locked out of my house taking my trash out … in my PJs! Embarrassing! But even worse, the next day I tripped over my dog and gashed my forehead. Hubby rushed me to the ER and luckily my CT scan came out fine. Still I have to deal with a terrible headache and five stitches on my forehead! (Still haven’t quite figured out how I’m going to work around that taking photos this week!) So, please tell me about your fun and relaxing weekend, so I can enjoy vicariously! Hee! What have you been up to, Dolls? And tell me, what type of cover up do you like to wear at the beach? That’s hilarious!! But I guess it all depends on your perspective, right?? I’m so sorry to hear about your fall, stitches are no fun, bless your heart! Stitches or not you’ll look great in photos – you always do! Sorry about your accident. Maybe you can take photos with only your “good side” facing the camera until things heal, or wear a hat and pull the brim down lower on one side. Beautiful cover ups! So sad to hear about the accident! Oh dear! You need some pampering! Oh my! For both cover ups that are NOT! And your “eventful” July. 😱 Hope the rest of the month is smooth sailing. And thanks for the great choices in cover ups. Beautiful and appropriate cover ups. I hope you feel better soon.